Ralph Peters is a writer, strategist, media commentator and retired military officer. He is the author of 33 books and over 1,000 columns, articles, essays and reviews. Uniformed service, personal interests and research have taken him to more than 70 countries and six continents. He served in the U.S. Army for 22 years, first as an enlisted man, then as an officer, retiring shortly after his promotion to lieutenant-colonel to write. He currently serves as Fox News Strategic Analyst, appearing on every major American television and cable-news network, as well as on many radio programs and in the international media. Also a novelist, under his own name and as Owen Parry, he has written a number of bestsellers with international settings, as well as prize-winning historical novels about the American Civil War. His New York Times bestseller Cain at Gettysburg won the 2013 American Library Association’s W.Y. Boyd Award for Literary Excellence in Military Fiction, after which his follow-up novels Hell or Richmond and Valley of the Shadow also won the Boyd Award, making him the first three-time winner in the award’s history.. 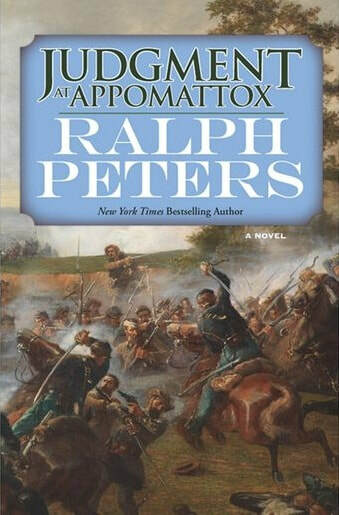 The Damned of Petersburg, the fourth novel in his five-book Civil War cycle, appeared in 2016 and the capstone book, Judgment at Appomattox, was published in 2017. His “by Owen Parry” historical novels have won the Hammett Prize and the Herodotus Award. In 2015, he received the Goodpaster Award as that year’s distinguished American soldier-scholar. Meeting Time: The doors open at 6:30 pm and the meeting begins at 7:00 pm ending 8:30 to 9:00pm. Meeting Cost: $30.00 includes tax, tip, food and fun. Purchase of a meal is optional. Reservations: Please make reservation(s) to attend this meeting by November 14. Late Reservations: Late reservations are welcomed and appreciated. Drusilla needs to know how many tables to set up. Book Raffle: There will be a selection of books or items. $1 per ticket or 6 tickets for $5. We are a Non Profit 501C3 Organization and can give tax receipts for donations. As far as what you can deduct on your taxes, check with your tax preparer. If you have items to donate, we can give you a charitable donation tax receipt. We can use donations of books in good shape and items for the raffle. Disclaimer: All articles posted do not reflex any position held by the BRCWRT. Articles are meant to be educational or entertaining. The opinions of the authors are not necessarily the opinion of the roundtable. We support no opinion or position. The BRCWRT presents both sides in a random fashion.